This is Video 4 in the Newman Projection Video Series. Click HERE for the entire series. 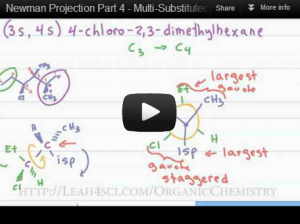 Hi Leah, I was just wondering, how do you know when to place the substituents on the right and when to place it on the left in the projection. Amazing job Btw, Thank you! It depends on the molecule presented. Swapping right and left will result in enantiomers so be sure to pay attention to HOW the molecule is presented. Wow. You just made my life a lot easier. Thanks! i wish all professors taught like you. Hi Lea, thanks a lot for giving us so much of your time. i ve lost the point few videos ago. what does it change in ”real life” happening the worst conformation ? i mean when the largest groups are eclipsing each other..